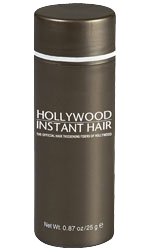 Hollywood Instant Hair is a unique product made from natural keratin protein fibers that mimick natural hair. These fibers can be used as an instant fix for thinning or balding areas on a hair system. Available in 9 salon quality colors that can be blended together for a close match to your hair system.